Extract brewing is a great way to get into home brewing. However, at some point, you may be interested in more complexity. This is where you are going to have to consider upgrading to an all-grain set-up. All-grain brewing is a little different than brewing with extracts. It is a bit more labor-intensive and requires a few additional steps. This means you will also need some additional equipment. The first significant difference between extract and all-grain brewing is you don’t use a malt extract syrup. Instead, you are getting the starches, flavor, and color from mashing grain. You will also need to remove the grain before you boil the wort. Mashing is the word used for the steeping process which hydrates the grain. This activates the malt enzymes and converts the grain starches into fermentable sugar. To aid in this process, you will require a homebrew mash tun. The mash tun is a vessel that houses the conversion of starches into the sugar. During this conversion, it is essential to keep a constant temperature. For this reason, mash tuns are usually insulated. Mash tuns also typically have a strainer at the bottom and a spigot. This way, when the grains have been mashed, you can rinse and drain from the same vessel. Because it is essential to get all of the grains out of your wort, it is common to strain it more than once. This is called recycling. There are different types of mash tun designs, so take into consideration the advantages and disadvantages of them before you pick one up. Here are 2019’s most popular mashing tuns for the DIY brewer. 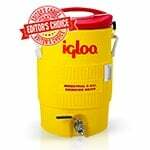 It may surprise you to hear that this 10-gallon Igloo mash tun cooler with stainless steel false bottom and valve is the most popular mash tun for home brewing. 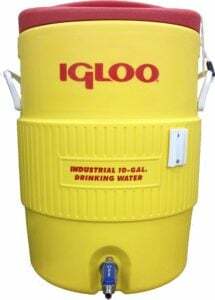 It has a ten-gallon capacity and is essentially a modified water cooler. The reason why these are so popular is that they are simple, durable, and work very well. Its sides are insulated to keep your wort to temperature, and it has a thick top that holds in heat and keeps out contaminants. At the bottom of the mash tun cooler is a stainless steel false bottom. This screen filters the wort before it leaves through the spigot. The spigot is also stainless steel and operates with a simple open and close valve. This false bottom mash tun is very similar to the Learn To Brew unit mentioned before. 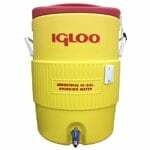 It is also a modified beverage cooler with a stainless steel false bottom and spigot. However, this kit also comes with a siphon sprayer, tubing, and a hot liquor tank. With the siphon sprayer and tubing, you can easily clean the tanks and move your wort. The hot liquor tank is a nice addition as it more easily allows you to regulate the temperature of your striking or sparge water. This is the water that is used to rinse the remaining grains after you drain the wort. 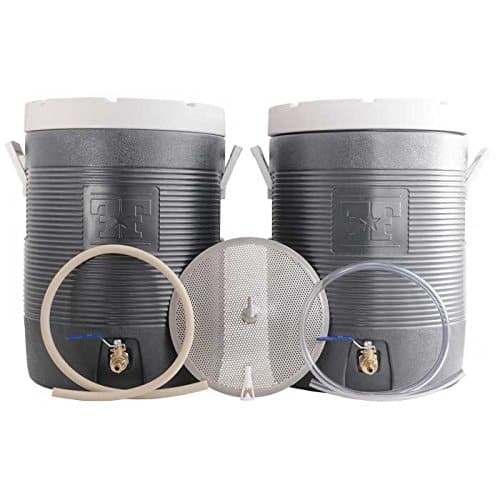 Overall a great pair of coolers to add to your all-grain brewing arsenal. 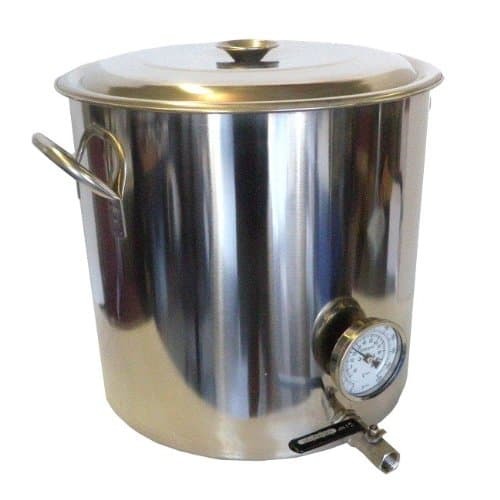 This 10 gallon stainless steel brew kettle is a little different than the plastic ones. In this case, rather than depending on an insulated mash tun, the temperature is regulated by a heat source. The heat source can be your stovetop or any burner alike. A tri-ply bottom helps to prevent scorching from direct heat. And regulating the temperature is made simple by an integrated thermometer that ranges from 60-220 F.
Like all homebrew mash tuns, the bottom has a metal screen to filter the wort, and it also has an additional strainer that can be attached to the spigot. Complete with lid and easily removed false bottom, this is a quality commercial product. 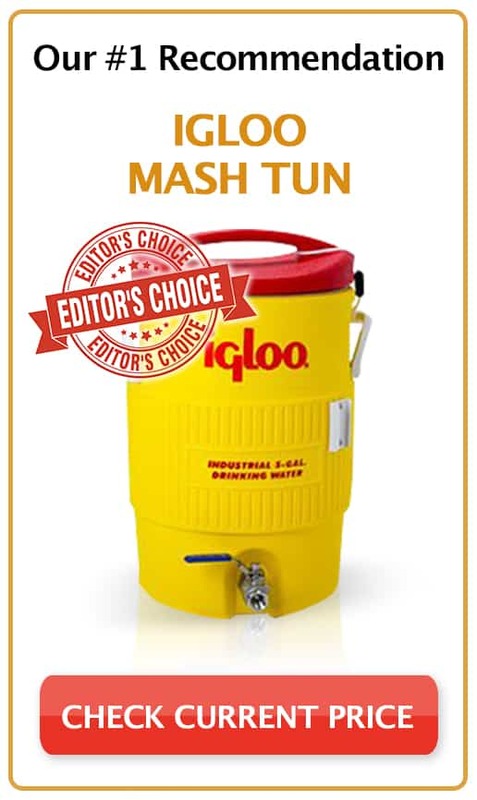 This is another popular plastic mash tun cooler. It is made by QuickFit but is almost identical to the Learn To Brew Mash Tun. It has the same stainless steel false bottom and valve just, but the only notable difference here is that the spigot gasket is known to leak occasionally. Personally, I have never had an issue with my spigots leaking, but this is an easy fix as there are many ways to ensure a proper seal. Similarly, this mashing tun also holds temperature well even for your hour mashes, and its false bottom does a good job of straining the wort. This is another solid stove top stainless steel mash tun. It is not meant to be kept insulated. Instead, it utilizes a heat source to regulate temperature. This is made easy with a built-in thermometer. Unlike most mashing tuns, this does not include a false bottom. However, it does come with a bazooka screen that is attachable to the spigot. The bazooka screen is typically used in addition to a false bottom as they are known to clog when used alone. This isn’t a huge problem because false bottoms are relatively inexpensive and bought separately, it can be easily installed. When you are looking for a DIY mash tun, what should you consider? Should you use a plastic or stainless tun? Both are designed to complete the mashing process with ease. There is no real production value difference between the two. When you are deciding between the two, consider the environment you will be in and which temperature your brew requires. In some cases, it may be best to go with a stove top mashing tun because you can easily regulate the exact temperature needed for particular enzyme activity. However, in most cases, you may only require a general temperature range, and it may be more practical to utilize a plastic unit. For a full summary of our top products and the different material types, see our video below. If you are a beginner home brewer, you should pick yourself a homebrew kit. 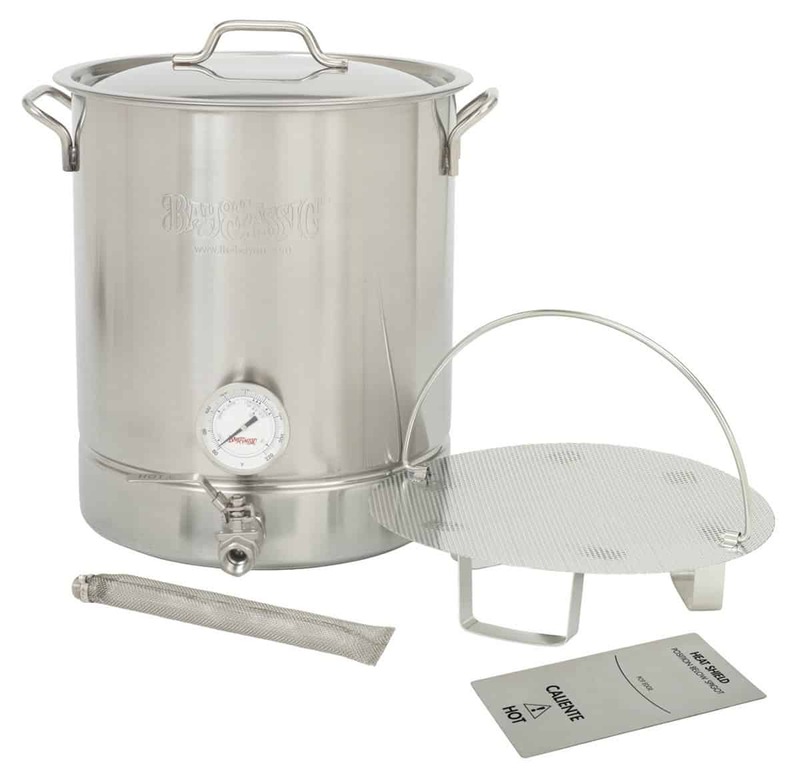 These kits include everything you need to get started on the journey of home brewing. Or if you would like to build your homebrewing arsenal as an advanced brewer, check out our essential supplies list. 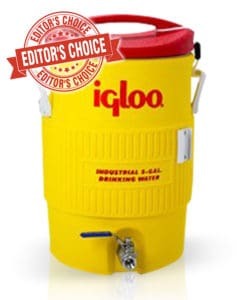 I have a had many good experiences with the Igloo Mash Tun. Regulating within a healthy temperature range is very easy, and I have only had to use striking water on rare occasions. It is also easily cleaned and can be put to the side while your grain is steeping. Picking this to be the best homebrew mash tun, I would say that this is an excellent option for the first time brewer looking for something more than homemade.